name is Keskesu. There is a similarity between the different names. Couscous accompanies savoury stew dishes and sweet dishes alike as well as in fresh summer salads. Savoury recipe examples from western Africa are Maffe and Yassa. is a fresh couscous salad that is known far beyond northern Africa where it originates. Couscous belongs to the pasta family. Instant couscous that is widely known beyond northern Africa is made from semolina, the coarse and purified middling of durum wheat. More difficult to find is couscous made of roasted brown rice or barley. In Brazil corn flour is used to roll the couscous. The instant couscous is pre-steamed and dried and therefore less time consuming to prepare than the traditional which is made from scratch. water before soaking the grains. couscous. Two to three steaming intervals are performed from anywhere between 20 minutes and 60 minutes. The rest of the time in between is used to let the couscous cool down and to break it up by using the hands, it is sprinkled with salt-water during the first interval and butter or oil after the breaking up on the second interval while rolling the grains through the hands. Variations depend on the accompanying dish and can consist of mixed under herbs, raisins, or nuts like pistachios or pine nuts. How to make couscous from scratch? flour was sprinkled with water and rolled into small balls. That’s the basic process. It takes patience. To get evenly sized balls sieves are used. The flour is rolled and broken up sprinkled with water and dusted with finer flour until the person preparing it is happy with the result. Later the couscous is steamed broken up and steamed for a second time. Then it really depends on what it is going to be used for. In this case it was used to prepare Thiacry or Chakery which is a sweet couscous recipe. 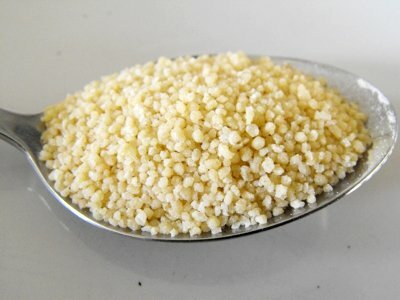 The steamed couscous was added to a mixture of fermented milk and sugar. Since it was Ramadan it was served when the sun went down to break the day’s fastening. My family has adopted a few couscous recipes. As a couscous dessert we tweaked Thiacry. 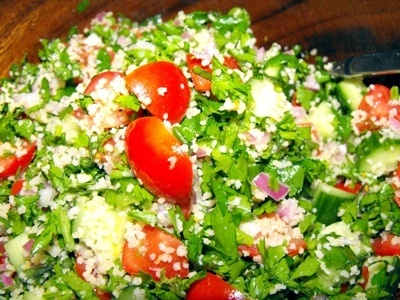 A fresh summer salad that gained our agreed vote is the Tabouli salad. Among the main dishes are two Senegalese recipes Yassa and Maffe which both are often served with couscous. The couscous accompanying the maffe often gets a sweet fruity hint with some raisins or sultanas mixed through. What are your preferred couscous recipes to cook? 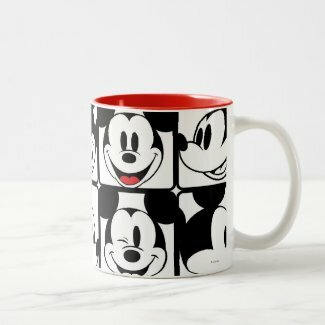 Build your very own page to inspire others and to receive comments. Up to 4 images to go with your recipe and instructions will invite cooks to try and comment. There are some pictures of traditional kitchen utensils used on my pinterest board. Here is the place to share special recipes using couscous.